Probably one of my favourite places in the whole world is the Isle of Skye. It is a mystical place. Rugged, wind-swept, beautiful and enchanting that often lifts me onto a different emotional plain. Sometimes you really don’t know what is on your doorstep. That was certainly true when I first went there, because there are elements to it that really blew me away, like going to Florence for the first time or walking along the Inca trail and stumbling upon Machu Picchu, and seeing landscapes in their natural beauty. The Three Chimneys is nestled in a village whose population would not even fill the restaurant – with a view overlooking the sea, the surroundings wild, bleak and sparse. Yet, despite the location, you have a venue in the Three Chimneys that has been known to receive traveling visitors to the helipad (i.e. the patch of grass opposite) for lunch and a reputation that belies its rural out-posting. Its reputation built upon the local seafood that surrounds the isle, all of which identified on the menu with the landing site for the catch. The traditional stone croft cottage has been transformed and is now incredibly intimate, to a degree that you are almost dining with the table next to you. A very reasonable wine list, heavy on white wine, led us into a white Burgundy from Nuits Saint George. I had conflicting thoughts about the menu, (unbalanced maybe? ), but I was there to eat the seafood: Hake, skate and razor clams to start, halibut and squid to follow. Gigha Halibut, Squid, Fennel. Caviar sauce. I have always been a bit skeptical of taking pictures of restaurant food, however beautiful it is (I am more in the Giles Cohen school), and I would probably annoy my wife exponentially by getting out my DSLR: filters, flashes, tripods and all. But in honour to all you bloggers that do, there is a little photo to the right (done with my iphone). It was a dish that typified our experience. Some parts phenomenal, some parts average. The squid was overcooked and not particularly enjoyable whilst the potatoes did not really bring anything to the dish against the fennel or the sauce. That said however, the gigha halibut was absolutely fabulous. It alone was worth the entry fee (if you had one). I probably do not have the linguistic capabilities to really express my delight at how good it was and how much I enjoyed it. With the caviar sauce, it was simply sensational. The anise and slight nuttiness of the fennel was also not too overpowering and added subtlety. That alone would have been sufficient for me. It was a BIG portion. My starter, equally, was the same. 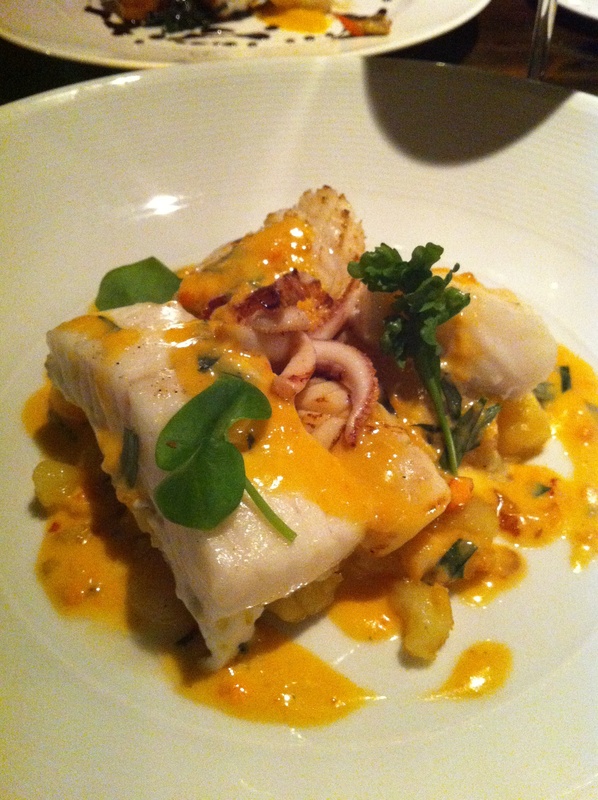 The hake was fabulous, as were the clams, but I struggled against the saffron potatoes and I could not taste the skate. My wife really enjoyed her partridge starter, but her monkfish in Ayrshire bacon was very salty (which may in part be of course due to the nature of the bacon). The scallop accompaniment however, made the dish. As soft and delicate as you can get. The deserts, the warm almond cake and the dark chocolate mousse with ginger, were both excellent, although the ginger was served separately so balancing the flavours proved problematic. The sommelier was suitably impressed by my wife’s origami with the napkins (she turns it into a chicken) that he gave us some complimentary dessert wines which was a nice touch, and typified the excellent service. The Three Chimneys is renowned for its marmalade soufflé, and judging by fellow diners’ reactions it was proving to a massive hit. It was pertinent to wash everything down with a Talisker, and all its smokey goodness. Walking out of the restaurant the view is simply stunning, and if you hit it at the right time of year the sunset phenomenal. This is what contributes to the magic that is the Three Chimneys. The food is good, but there are elements you would not expect if it was in say, London. Ironically it has been outstripped by Kinloch Lodge (which has been awarded a Michelin Star, and dining there really does feel like you are enjoying dinner in Laird MacDonald’s house) as THE location restaurant within Skye. That competition can only be a good thing, because it will help drive the Three Chimneys on it bigger and better things. I will remember that Halibut for a long while; next time you hope everything is as good. We slowly drove back down the single track lane back to our apartment, to a wonderful log fire and yet another night-cap. The raw majestic qualities of Skye will never fail to dazzle me.